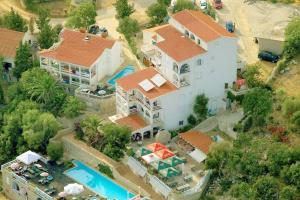 Set in Stara Novalja, 39 km from Baška, MacAdams Apartments features a swimming pool and fitness centre. Some units have an outdoors terrace and/or balcony with sea views. MacAdams Apartments also includes a seasonal outdoor pool. Visitors can enjoy the on-site dining establishment, with special diet menus and packed lunches available on request. Beach Babe ~ 7,2 km from MacAdams apartments Gravel beach: ideal for families, with caffe bar, equipped with showers. Excellent choice of watersports. Beach Trincel, Stara Novalja ~ 8,1 km from MacAdams apartments Sandy beach: ideal for families, recommended for young people, awarded with blue flag, with restaurant, with caffe bar, equipped with showers. Excellent choice of watersports. Beach Vrtic ~ 9,4 km from MacAdams apartments Sandy beach: recommended for young people, with restaurant, with caffe bar, equipped with showers. Excellent choice of watersports. Beach Pudarica, Barbat ~ 10,2 km from MacAdams apartments Gravel beach: ideal for families, recommended for young people, with caffe bar. Excellent choice of watersports. Beach Strasko, Novalja ~ 10,4 km from MacAdams apartments Gravel beach: ideal for families, recommended for young people, awarded with blue flag, with restaurant, with caffe bar, equipped with showers. Excellent choice of watersports.